Of course Veritas and AFM were the outstanding German race car marques of the post-war era. But they were by far not the only ones to try. But setting up production series of race cars has never been easy and was always connected with financial risk, so that the number of those who succeeded is naturally very limited. Among those who can at least claim to have tried it are three men on our picture, Helmut Polensky, Egon Brütsch, and Hermann Holbein (whose car can just be spotted in the dense smoke at the back of the grid). 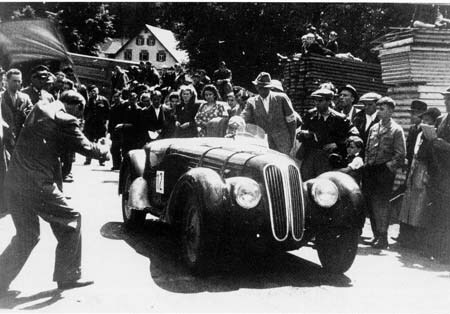 A true pioneer of German post-war racing, Hermann Holbein with his BMW 328 at the very first race in Germany after the war, the 1946 Ruhestein hillclimb, where he won competition of the ungraded drivers in the sports car class. In the Veritas chapter I already mentioned the involvement of Hermann Holbein in the foundation of their first RS sports car before he departed to build cars under his own name. Hermann Holbein, a direct descendant of the famous painter Hans Holbein, had been an engineer at the BMW factory. After the war he began a racing driver's career, starting in the very first post-war race in Germany, the 1946 Ruhestein hillclimb in an BMW 328 production sports car. At that time in Germany classification into "graded" and "ungraded" drivers was still valid, both of which had to start in separate races. The idea was to keep away inexperienced pilots from the highest level. When an "ungraded" driver had been approved in a distinct number of races he would be promoted to "graded" status. It were the achievements of drivers like Holbein, who had set by far the fastest practice time and even left the former Mercedes champion Hermann Lang behind him, which caused the officials to abolish this antiquated rule. The new Holbein HH47 sports car at its debut race in Hockenheim. At the same time as other former BMW engineers like Loof and von Falkenhausen, Holbein began converting a standard production BMW 328 into a more competitive race car. Initially he was involved in the construction of the very first Veritas RS sports car, but progress did not develop as he liked it and so he decided to do it his own way. So he contacted Willi Huber, who had also left the Veritas project and returned to his garage on the Fraueninsel at the Chiemsee lake (to and from which all cars and parts had to be rowed across the lake! ), to build a car according to his plans. At that time Huber could not complain about lack of employment as he had been already contracted by von Falkenhausen to deliver the bodywork of the very first AFM sports car. 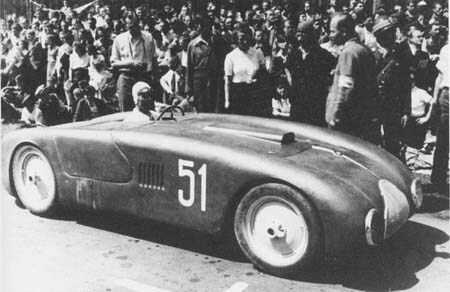 Similar to the Veritas Holbein had also used the famous streamlined BMW 328 roadster as a pattern, in which von Hanstein had won the 1940 Mille Miglia. So not surprisingly his car and the new Veritas RS were quite similar. Best hint to distinguish them from each other is the upper line of the bodywork: while that of the Holbein HH47 runs convexed from the front end to the back of the car the Veritas featured a straight horizontal line with bends only near the ends of the bodywork. Another possibility of distinction was the colour of the cars. As Germany was banned from international racing the cars did not necessarily have to be painted in the national race colours, white or silver. Instead, to add some colour to the races, Holbein's car was painted blue ("the Blue Bird of Ulm"), while his BMW 328 had been black and his next car, the HH48, red. Holbein gave the car its debut at the season-opener at Hockenheim, but it did not last to the finish. It did at the next race at Munich, where Holbein finished in second place behind Kling's BMW 328 after the race had been stopped due to a car running into the crowd. The first victory was scored at the Eggberg hillclimb, where the favourites of the 2-litre class, von Falkenhausen in the AFM and Kling in the very first Veritas RS, both ran into technical problems. The Holbein-BMW HH48, Germany's second Formula 2 car. When the FIA announced the new Formula 2 to be introduced for 1948 of course nobody had been concerned about Germany, whose drivers and cars were completely banned from the international scene after the war. But unintentionally the new rules favoured German interests most, as the BMW 328 happened to be the strongest 2-litre engine of pre-war times. After the introduction of the new D-Mark for the first time since the war there was reason for some economical optimism and in company with this more and more racing enthusiasts reappeared again with new cars. Among them was of course Hermann Holbein. He designed a spaceframe chassis, which was mounted on a solid box section, and the bodywork was again delivered by Huber (doesn't it look very elegant on the picture?). The car featured some interesting solutions, for example a drive shaft "around the edge" with a kardan gear just below the cockpit. Thus the driver's position could be lowered within the car. Very remarkable was also the rear axle, which could be converted within a very short time from a de Dion into a fully independent configuration. The whole car weighed only 510 kg, the lightest of the contemporary Formula 2 cars. The engine was delivered by Polensky, who, besides building a car of his own, was a successful tuner of BMW engines at that time and both German Formula 2 pioneers appeared at the Karlsruhe race in June 1948 for the first time in public. But just before the race Holbein had discovered a technical problem, so he obviously tried to take care of his car and gave up before the end of the race. At Aachen the car lasted the distance, but Holbein only finished fourth of four starters and then he left the race at the demanding Schottenring. His last race was the Eggberg hillclimb, where he started in the Formula 2 class with the HH48 as well as in the sports car race with his HH47. With this he finished second behind Kling in the Veritas, but the HH48 suffered from a broken camshaft after only 5 km. 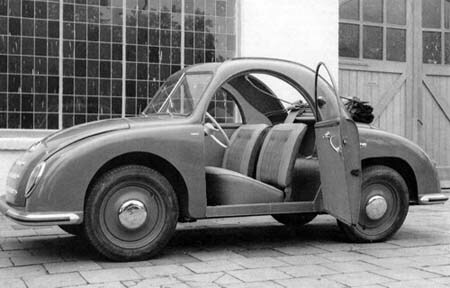 The Champion 400, one of a big variety of small cars, which were produced in Germany during the fifties. In spite of building up a second Formula 2 car with a true spaceframe chassis, the HH49, Holbein soon lost interest in racing and tried to go a common way among German post-war constructors by building up a series production of small cars of the "Champion" marque. In doing this, he was among the more successful among manufacturers of small series in Germany, as he was able to keep up production until 1955, before the factory was sold to motorcycle manufacturer Maico. Alas, all I know about the HH49 are rumours. It seems to have been completed, but never raced. I remember to have read somewhere that it had been sold, but I can not recall to whom. So at the end of 1948 he sold his stock of cars to newcomer Fritz Rieß from Nuremberg, who took them both with him to the very first race he ever started in, the 1949 Maipokal at Hockenheim. Fritz Rieß in his first racing season with the Holbein HH48 at the Schottenring. In his first race, in the Formula 2 class at Hockenheim, Rieß' drive into a distant third place was hardly noticed by anybody, as the crowd was fascinated by the fierce battle between Ulmen and von Falkenhausen. Despite this he repeated this result in the sports car race, as certainly nobody would have expected to have seen one of Germany's future champions here. But this was soon to change as already in the next event, the very wet race at Munich, he won the 2-litre class from Ulmen when the leading Schoepflin had to retire near the end of the race. Ulmen, who had finished second, took revenge by winning the Formula 2 race in front of Rieß. It soon turned out that Rieß developed quite into a specialist for driving in the rain, as also at the demanding Schottenring he scored some very good lap times in the wet. The 1949 season was a very busy one so Rieß had many opportunities to gain some experience. At the end of the year he had not only scored the victory at Munich, but also four other podium finishes in his sports car and a further five in the monoposto. "Bernhard Nacke" alias Karl-Günther Bechem on the ancient Holbein-BMW HH48 during the 1952 German Grand Prix. As busy as the 1949 season had been for the Holbein cars as lazy turned the 1950 one to be for them. Holbein himself, who had still looked after the cars during 1949, had completely turned his attention away and Rieß expected more by switching to the new Formula 2 AFM, while he took over Bossong's Veritas Pontoon for the sports car events. 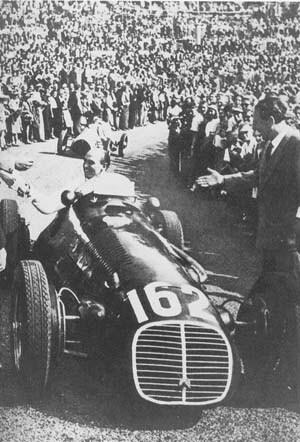 In exchange he handed the HH48 to Bossong, who appeared only once, at the German Grand Prix, where he did not finish, before selling the car to Karl-Günther Bechem for 1951. The HH47 disappeared at the same time from the entry lists. However, nothing is known about its further fate. It might be even possible that it was simply regarded as a Veritas from then on and entered as such. Also the HH48 did not turn up for a while. It lasted until well into the 1952 season, more than four years after its completion, before it reappeared in the entry list for the German Grand Prix to be driven by the obscure "Bernhard Nacke". This soon turned out to be a pseudonym for Karl-Günther Bechem, whose growing fame made him afraid of having a bad effect on the reputation of his father's business. Up to this time he had concentrated on sports car racing, but with the Formula 2 race at the Nuerburgring becoming a world championship event in 1952 he certainly was eager to take his chance and at least the HH48 was a true Formula 2 car. He started the race from the last row of the grid and retired during the sixth lap with engine troubles, but at least he had taken part in a Grand Prix, which not every driver can be proud of. But the Holbein story is not yet completed. Bechem took the old car to the high-speed Avus race, where it again broke down. After this he sold the car to Per-Gunnar Wahlberg of Sweden, who later had a fatal accident with it. 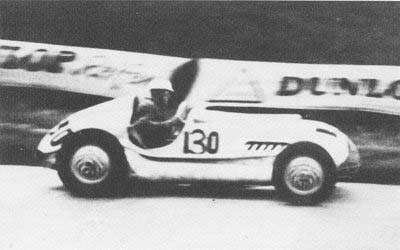 Polensky in his home-built "Kurpfalz" Special at the Schottenring in 1947. Helmut Polensky, an engineer from East Germany, who had settled down after the war at Hamburg, had been German champion in the 2-litre sports car class in 1939 - in a BMW 328, of course! Now, in 1947 he turned up again with a self-built BMW-based Intertype sports car, like so many of his contemporary drivers did at the same time, too. He called the car "Kurpfalz", after a province in Germany's south-west and made his debut at the Schottenring. Without Kling and von Falkenhausen taking part in that race Polensky lay safely in the lead when the car lost a rear wheel and the driver was lucky to escape unhurt. Polensky had good chances for a win again in the race at Hamburg before he was stopped by an engine failure. After this the car does not appear in my records. Perhaps it was broken up to deliver spare parts for Polenksy's next project. The debut of Germany's first Formula 2 cars: Polensky's Monopol in front of Holbein's HH48, probably at the race at Karlsruhe in 1948. During winter Polensky had moved to Karlsruhe in the south-west of Germany, where most of the races took place. With the announced introduction of the new Formula 2 in 1948 he decided to be the first German to build a car according to its rules. Again to keep things simple Polensky chose VW-like independent suspension that was attached to a very slender tube-section chassis. Of course it used the familiar BMW engine, and altogether the car weighed some 550 kg. Polensky christened his car the Monopol (Monoposto of Polensky), which inspired some reporters to the word-game "Monopol vs. Monohol", when it appeared simultaneously to Holbein's HH48 in time for the race at Karlsruhe. Unlike his opponent in the red HH48 Polensky's car, in silver colours, made a promising debut and led from Brütsch's much more powerful Westenrieder-Maserati throughout most of the race before he had to retire with an engine failure just before the end of the race. As a consolation for the lost victory at Karlsruhe he won the next race at Aachen in superior fashion, leading from start to finish, and added two second places to his score at the Eggberg hillclimb and at the ultra-fast Grenzlandring. 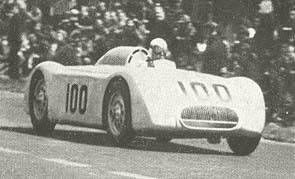 The Monopol with streamlined bodywork at the 1949 race at Hockenheim. When the 1949 season started on the fast Hockenheimring, Polensky tried to gain some advantage by fitting some pontoon bodywork to the car, but in the end he failed to finish there. Polensky in his Monopol on his way to his greatest victory in the race at the Schottenring in 1949. For the twistier circuits during the rest of the season he reverted to the original open-wheeled bodywork, which brought him success at the very demanding Schottenring. At Tübingen he drove an inspired race to make up some ground, which he had lost because of an early spin, but then his engine ran a bearing - the old BMW 328 disease had struck again. Another retirement at the Nürburgring, a fourth at the minor race at Nuremberg and another fine second place at Cologne at the end of the season were his further results that year. 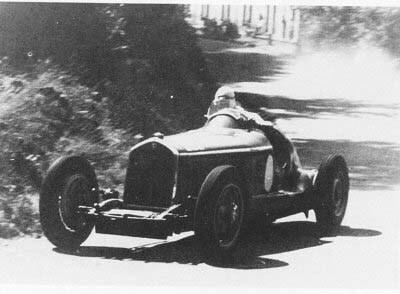 A picture taken at the 1950 Schauinsland hillclimb. Behind Pietsch's Formula 1 Maserati of Scuderia Milan in the background the Monopol can be spotted. Any ideas who the driver is? With the appearance of the new AFM and Veritas Formula 2 cars tiny manufacturers like Polensky or Holbein had more and more problems to stay competitive. In order to stay in business they had to step aside into minor classes. And that's what Polensky did, too. He sold the Monopol to Richard Küchen Jr, who intended to install one of his father's new V8 engines (a project which seems never to have been realized), while Polensky went on to build a tiny 750cc sports car, called the Fidelitas, in which he took part in the Giro di Sicilia, partnered by Walter Schlüter. So who is the driver of the Monopol in the picture? Was it Polensky himself, giving his faithful car its last farewell race or was it Küchen, already trying out his new toy? Alas, I have not found any information about this yet. 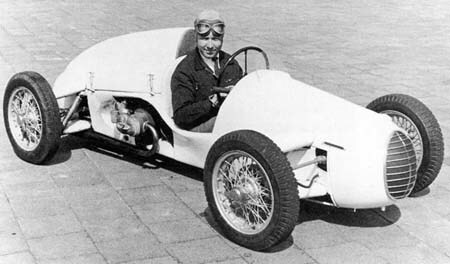 Polensky in his rear-engined Monopoletta of the small cars category. After that he turned his attention to the newly introduced Formula 3, for which he built one of the most beautiful cars of that period, the Monopoletta. Again he had chosen a rear-engined layout, with the 500cc BMW motorcycle engine attached without a differential to the rear axle. Overall weight was only 265kg and altogether four of this type were built. 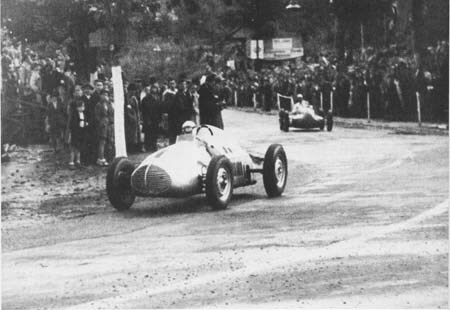 The debut race was at Schotten, where American J Lucas finished third and Polensky himself won at the Schauinsland hillclimb, while the support race of the German Grand Prix was won by Schlüter. But in 1951 another reservate for the German amateur special builder became occupied by much stronger opposition, as more and more Coopers, Kiefts, Effyhs, Emerysons and even Scampolos from Germany swamped Formula 3. For the Monopoletta there was nothing left to win. 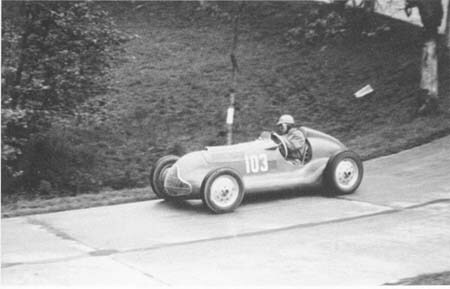 Egon Brütsch in his Monza Alfa Romeo, which he had converted into a single-seater, at the Eggeberg hillclimb in 1947. The reason why the efforts of Egon Brütsch appear in the smaller marques' chapter, despite the fact that he had only two race cars built which were not even according to the Formula 2 rules, is simply the fact that he tried to establish himself as a manufacturer of small - errm - tiny scooter cars after finishing his racing activities. And besides that his story is interesting because of another fact, as it is almost the story of German post-war Formule Libre racing itself. The amount of true spirit of enterprise, which he needed for all his activities, and of course also the money necessary for them he had obviously inherited from his parents, who were successfully producing women's stockings. So to get his hands on a racing car should not have given him great problems at a time when the true German currency on the black market consisted mainly of cigarettes and... stockings. 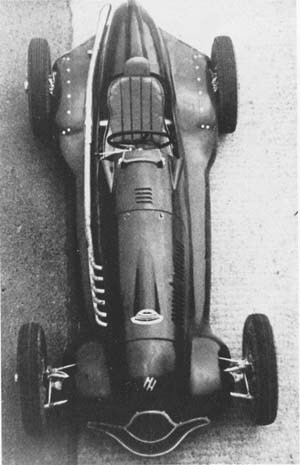 As a consequence it was he who brought the most powerful race car to the very first circuit race in post-war Germany of 1946, an Alfa Romeo Monza. In some sources the story is told that this was the car that had belonged to Rudolf Caracciola before his membership in the Mercedes-Benz Grand Prix team, but it seems to be more logical to me that it is in fact a car that was raced by Paul Pietsch between 1932 and 1934. In Pietsch's biography it is told that his car had been rebodied into a single-seater for 1934, like the car in which Brütsch appeared at Karlsruhe in 1946. Of course, with this mighty supercharged car Brütsch was favourite for the race, but the ancient engine could not be charged too hard any more and von Falkenhausen in his standard production BMW 328 took over and left him behind. The same thing happened again at Hockenheim in 1947, where Stuck won in the little unsupercharged 1100cc Cisitalia with Leonhard Joa in his supercharged 1500cc Maserati finishing second. At last Brütsch was able to score a win at the Eggberg hillclimb, but only because the race had been divided into two classes, as both competitors of the 1500cc class, Joa and Stuck, had again been faster than him. 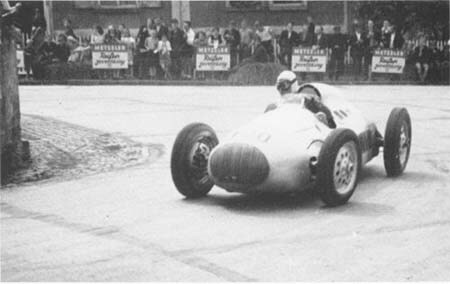 Brütsch in the new Westenrieder-Maserati at Karlsruhe, 1948. 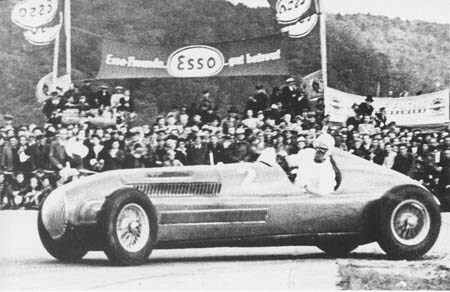 The defeats of 1947 against much smaller cars were proof enough for Brütsch that modern chassis technology could not be matched by sheer horsepower. But of course it was an obvious conclusion that horsepower and a competitive chassis would certainly give him some advantage over his opponents. So first of all the task was to find a suitable power source. The Alfa engine was already too worn out for any further use. But there was yet another available engine existing within Germany, and Brütsch had no big problems digging it out. Brütsch also looked for some talented mechanic that could build a suitable chassis around this engine, and finally contracted a Mr. Westenrieder. This engineer took the frame of an Alfa Romeo military vehicle, which had survived the war, and stretched and strengthened it so that the huge Maserati engine could fit in. The result was again a true giant of a car, which, despite its official designation EBS (Egon Bruetsch, Stuttgart), was simply called the "Westenrieder-Maserati" by the press. At its debut at Hockenheim the car was plagued by tyre failures, its heavy weight demanding its toll, so Brütsch finished in third place, a lap down to Schorsch Meier, who won the race in his Veritas RS. So Brütsch had to wait until the race at Karlsruhe before he could earn his first winner's laurels, but after that his season developed very well and he was beaten only once, when he finished second behind Polensky at Aachen. Highlight of his season was certainly his race at the very Schottenring. Here his driving performance can not be considered too highly, in an unwieldy and heavy car on such a twisted circuit. 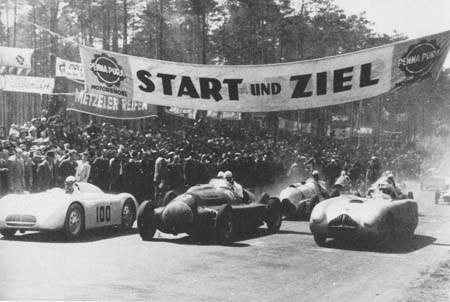 The start of the 1949 Hockenheim race. In the center Egon Brütsch's Westenrieder-Maserati (112). The other starters: outside left Polensky / Monopol Streamliner (100), outside right Toni Ulmen / Veritas RS. Second row from left to right: Fritz Rieß / Holbein HH48, Roland Mall, "Eigenbau"-BMW, third row: Alexander von Falkenhausen / AFM 49. 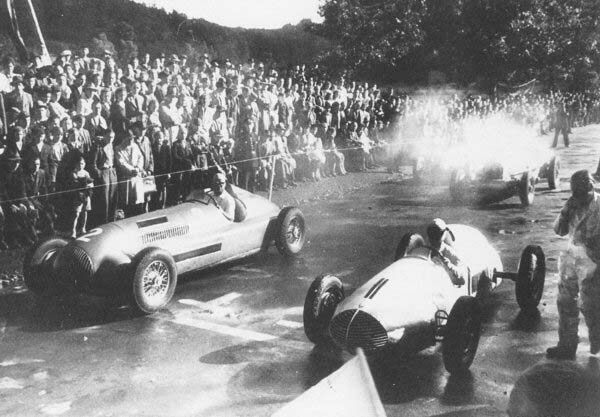 In the background the grid of the simultaneous race of the small-car class, the predecessor of Formula 3 in Germany. With the introduction of Formula 2 discussions came up how the race car classes should be categorized. Brütsch's supercharged species developed more and more into an anachronism, but certainly the car must have been quite impressive to watch, and at least he had already put some money and effort into it. So perhaps to continue to offer the crowd the sensation of such a monster it was decided that the races would be still run according to the "Free Formula", including a Formula 2 class in which the German championship was decided, like it had already been in 1948. But the tide had already turned. 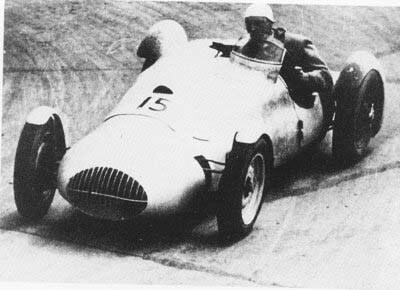 Whereas Brütsch had had a clear advantage against the first Formula 2 prototypes in 1948, he had no chance against the much more developed cars of 1949. This soon became obvious when he could add only one single win to his records, the race at Tübingen, while the rest of the season was marred by technical problems. Is this picture a fake? Somehow it looks as if the shape of Brütsch's EBS II-Bugatti, claimed to be taken at the Schauinsland hillclimb, has been manipulated by some sort of a cut-and-paste operation. With the signs of the times in his mind Brütsch had asked Westenrieder to build a new, lighter monoposto chassis for him. This time the chassis was built from scratch, using a double-tube frame with rubber-sprung suspension. But what engine should be used? Brütsch would not have been Brütsch when he had decided towards the BMW. Instead he favoured the promising V8 engine which had already been announced by Richard Küchen. Until this would be available an old supercharged 2.3-litre Bugatti 51 engine was used as a stop-gap, as the Free Formula was still valid! According to my knowledge this car was raced only once, at the Schauinsland hillclimb in 1949. 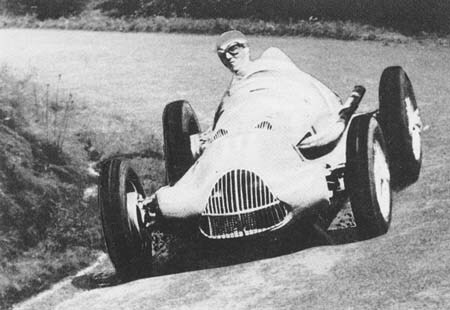 There Brütsch showed such faith in his new car that he offered his Maserati to Stuck, who delivered him a straight defeat. Even the winner of the small-car class had been clearly ahead, so this must have been a big disappointment. 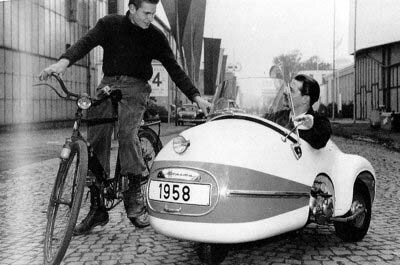 Brütsch Mopetta, a tiny single-seater scooter car of 1958 with plastic bodywork and 50cc engine of 2.3hp. According to advertising it could even swim! It seems that Brütsch never really recovered from his disappointment of the 1949 season, as he disappeared from the scene, concentrating on a production series of tiny plastic-bodied scooter cars, which he gave telling names like Spatz ("sparrow"), Zwerg ("dwarf") or Gnom ("gnome") and which stood in complete contrast to the dimensions of his previous race cars.